Let’s be clear about something: it is infuriating that most interesting artists are perfectly capable of functioning in at least two or three professions that are, unlike art, respected by society in terms of compensation and general usefulness. And compensation — which is money — is not only for feeding lavish lifestyles or taking spontaneous beach vacations. Ask anyone who has children or sick relatives in a country without good health care — which could now be almost any country as the administration of life is deferred more and more to the private sphere of personal finance. This only makes the question of fair compensation all the more pressing — it is no longer an issue of some kind of moral or ethical principle, but of life itself. So why should so many talented and hyper-qualified artists submit themselves willingly to a field of work (that is, in art) that offers so little in return for such an huge amount of unremunerated labor? For some reason, either due to artists’ own vanity, to being hypnotized by some sort of authorial diva imperative that promises large-scale recognition, or due to the expectations of the culture itself (not the field of “cultural production” but the de facto one, the less dynamic and slower moving one) and its own befuddlement with regard to artists’ usefulness, the artist is left to expend an enormous amount of professional energy in the doldrums of a murky pseudo-profession that absorbs work under the auspices of some kind of common belief in its higher value. But art is not a religion, and, though it often seems structurally similar, it is not a charity either. This idea of a “higher value” that presides over — and indeed fuels — an idea of art labor as free labor must be contested. All are to blame for it: though classical exploitation is rampant, it may actually pale in comparison to the amount of self-exploitation — the willingly inconclusive, highly generative work that is either too useless or too stubborn to ever align itself with the mundane, but remunerated, field of average labor: that of bakers, garbage men, police officers, cobblers, lawyers, engineers, day laborers, and so forth. These are the people you make your work about, and perhaps who your parents are. Art, you would like to think, is a shining vision of a possibility for something else. One option is to blame it all on authorship and the cult of the author. But that seems frankly ridiculous. Erase your name, and not only will you not get paid for your time, you will not get credited either. It’s like performing an act of charity for a plant. The only option available could be to simply work more — but while claiming the privileged capacity of the artist within the fields where your determined amateurism has made you a functional expert. Boris Groys, Art and Money: One repeatedly hears that the art market, distorted by the private taste of wealthy collectors, corrupts public exhibition practice. Of course, this is true in a sense. But then what is this uncorrupted, pure, public taste that is thought to dominate an exhibition practice that surpasses private interests? Precarious Workers Brigade, Fragments Toward an Understanding of a Week that Changed Everything…: Regardless of how these questions are to be resolved, we are noticing how nice our bodies feel after these weeks, having been away from our routines and the computer, from the mute sites of our work. It becomes even clearer that this “work” — whether that of the teacher, student, or artist — is not all there is to fight for. Simon Sheikh, Positively Representation of Banking Revisited: Strauss’s essay traces the change in bank architecture from the grandiose imperial style to its near disappearance as it came to favor modernist transparency, seeing this as ideological, and as representational. In short: banks represent. Franco Bifo Berardi, I Want to Think: POST-U: Let’s not forget that in the 1990s — when the web prompted a new environment for cognitive activity, mutating the very methodology of producing and distributing knowledge — many theorists, technologists, and economists spoke optimistically of a long, inexhaustible economic boom, spreading the idea that collective intelligence and capitalism were finally allied. Hito Steyerl, In Free Fall: A Thought Experiment on Vertical Perspective: Paradoxically, while you are falling, you will probably feel as if you are floating — or not even moving at all. Falling is relational — if there is nothing to fall toward, you may not even be aware that you’re falling. If there is no ground, gravity might be low and you’ll feel weightless. Objects will stay suspended if you let go of them. Whole societies around you may be falling just as you are. And it may actually feel like perfect stasis — as if history and time have ended and you can’t even remember that time ever moved forward. Dieter Roelstraete, On Leaving the Building: Thoughts of the Outside: Now if we all have blood on our hands — it is pretty much impossible to argue that we don’t, and this inevitably reduces the discussion to a rhetorical variation on an ancient logical paradox—it is not just because we are simply “caught” inside a totality, the totalizing character of which even the most totalitarian master narratives of modernity could not have hoped to match; it is because we accept that the terms under which we are caught inside that this totality can no longer be negotiated. Hu Fang, Wittgenstein House: I slipped out and crept up the staircase. The ceiling lamp cast an even, serene, yet totally dull light in the space. Quietly, I opened the glass doors on the second level. The corridors were not lit, though the door to the room at the end was unlatched, revealing a lucent streak akin to sunlight. 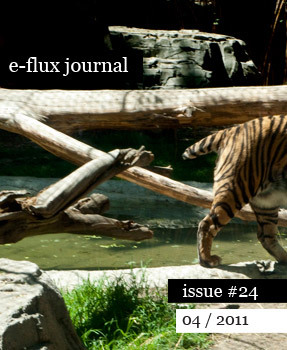 The print edition of e-flux journal can now be found at: Amsterdam: De Appel / Rijksakademie van beeldende kunsten Antwerp: M HKA Museum van Hedendaagse Kunst Athens: OMMU Aubervilliers: Les Laboratoires d’Aubervilliers Auckland: split/fountain Austin: Arthouse at the Jones Center Banff: Walter Phillips Gallery, The Banff Centre Barcelona: Arts Santa Monica / MACBA Basel: Kunsthalle Basel, Museum fur Gegenwartskunst Bergen: Rakett Bern: Kunsthalle Bern Beijing and Guangzhou: Vitamin Creative Space Beirut: 98weeks Berlin: b_books / Berliner Künstlerprogramm – DAAD / do you read me? / NBK, Neuer Berliner Kunstverein / Pro qm Berlin and Zurich: Motto Bialystok: Arsenal Gallery Birmingham: Eastside Projects / Ikon Gallery Bologna: MAMbo – Museo d’Arte Moderna di Bologna Bregenz: Kunsthaus Bregenz Bristol: Arnolfini Brussels: Wiels Bucharest: National Museum of Contemporary Art Bucharest (MNAC) / Pavilion Unicredit Cairo: Contemporary Image Collective (CIC) / Townhouse Gallery Calgary: The New Gallery Cambridge: Wysing Arts Center Castello: Espai d´art contemporani de Castelló (EACC) Chicago: Graham Foundation / The Renaissance Society Dubai: Traffic Dublin: Dublin City, The Hugh Lane / Project Arts Centre Dusseldorf: Kunstverein für die Rheinlande und Westfalen Eindhoven: Van Abbemuseum Frankfurt: Portikus – Städelschule Gdansk: Centrum Sztuki Współczesnej Łaźnia Genève: Centre de la Photographie Ghent: S.M.A.K Glasgow: CCA Centre for Contemporary Arts / Sculpture Studios Graz: Grazer Kunstverein / Kunsthaus Graz / para_SITE Gallery Grijon: LABoral Centre for Art and Creative Industries Hamburg: Kunstverein Helsinki:Museum of Contemporary Art KIASMA Hobart: INFLIGHT Hong Kong: Asia Art Archive Istanbul: BAS / DEPO / Platform Garanti Cologne: Kölnischer Kunstverein Kansas: INKubator PRESS Leeds: Pavilion London: Architectural Association/Bedford Press / Gasworks / ICA / Serpentine Gallery/ The Showroom / Visiting Arts Los Angeles: REDCAT Lisbon: Maumaus, Escola de Artes Visuais / Oporto Ljubljana: Moderna Galerija Luxembourg: Casino Luxembourg Madrid: Brumaria / CA2M / Pensart Marfa: Ballroom Marfa Melbourne: Monash University Museum of Art Mexico City: Proyectos Monclova Milan: Fondazione Nicola Trussardi Milton Keynes: Milton Keynes Gallery Minneapolis: Walker Arts Center Moscow/ Garage Center for Contemporary Culture Munich: Museum Villa Stuck / Walther Koenig Bookshop, Haus der Kunst Munich New Delhi: Sarai-CSDS New York: e-flux / Independent Curators International (ICI) / Printed Matter, Inc Nottingham: Nottingham Contemporary Omaha: Bemis Center for Contemporary Arts Oslo: Kunstnernes hus Padona: Fondazione March Paris: castillo/corrales – Section 7 Books / Centre Pompidou / Palais de Tokyo Pori: Pori Art Museum Porto: Museu de Arte Contemporânea de Serralves Portland: Portland Institute for Contemporary Art, (PICA) / Publication Studio Prague: Dox Centre for Contemporary Art Prishtina: Stacion – Center for Contemporary Art Prishtina Providence: AS220 Ramecourt: Performing Arts Forum, St Erme Outre et Ramecourt Reykjavik: Reykjavik Art Museum Riga: Kim? Rio de Janeiro: Capacete Rotterdam: Witte de With Saint-Nazaire: Le Grand Cafe, Centre D’art Contemporain Salzburg: Salzburger Kunstverein San Antonio: Artpace São Paulo: Master in Visual Arts, Faculdade Santa Marcelina Sarajevo: Sarajevo Center for Contemporary Art Seoul: The Books / The Book Society Sherbrooke: Foreman Art Gallery of Bishop’s University Sofia: ICA Sofia / Sofia Art Gallery Skopje: Press to Exit Project Space St Louis: White Flag Projects Sydney: Artspace Stockholm: Bonniers Konsthall / Index / Konstfack, University College of Art, Craft and Design Stuttgart: Württembergischer Kunstverein Stuttgart Sydney: Artspace Tallinn: Kumu Art Museum of Estonia The Hague: Stroom Den Haag Toronto: Mercer Union / The Power Plant Torun: Centre of Contemporary Art Znaki Czasu in Torun Utrecht: BAK, basis voor actuele kunst / Casco-Office for Art, Design and Theory Vaduz: Kunstmuseum Liechtenstein Valletta: Malta Contemporary Art Foundation Vancouver: Morris and Helen Belkin Art Gallery, University of British Columbia / READ Books, Charles H. Scott Gallery, Emily Carr University of Art and Design Vigo: MARCO, Museo de Arte Contemporanea de Vigo Vilnius: Contemporary Art Centre (CAC) Vitoria-Gasteiz: Montehermoso Kulturunea Visby: BAC, Baltic Art Center Warsaw: Zachęta National Gallery of Art Wiesbaden: Nassauischer Kunstverein (NKV) Yerevan: Armenian Center For Contemporary Experimental Art, NPAK Zagreb: Gallery Nova / Galerija Miroslav Kraljevic / Institute for Duration, Location and Variables, DeLVe Zurich: Postgraduate Program in Curating, Zürich University of the Arts / Shedhalle / White Space.